So, those of you who have followed me from the very beginning will know that this blog all started with a tea everyday, and usually a little something was said about the teas. This hasn’t really been happening in a while, but I just want you to know that I have not abandoned tea, far from it in fact. This is a little round up, a tea-cap if you will, of all the teas currently doing the rounds in my cup. Some have been with me a long time, some are much newer, some are good, some less so. But here you go! 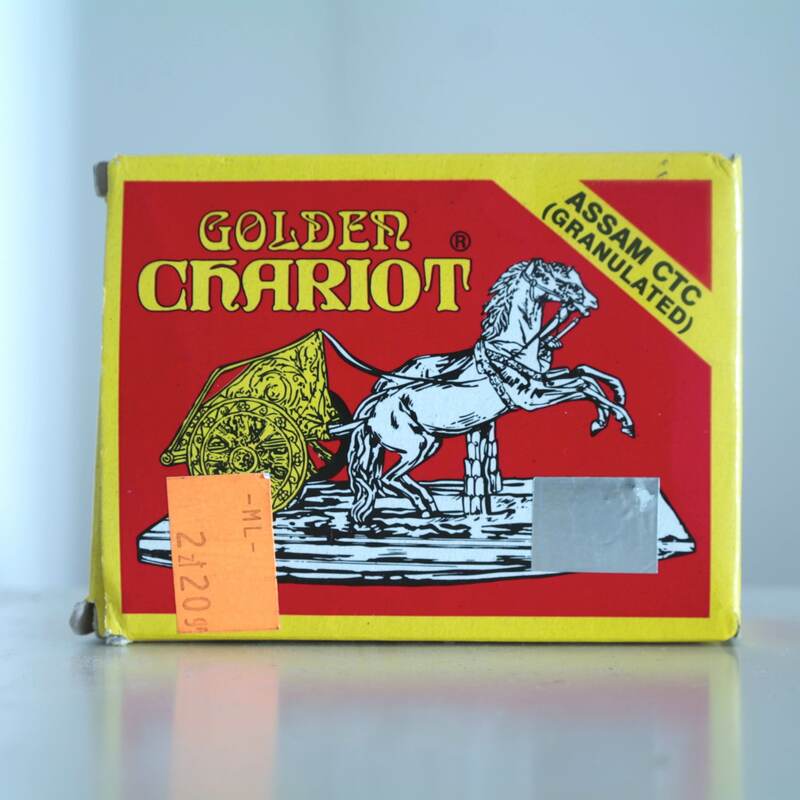 The Golden Chariot tea above is not very good quality tea at all, hence it costing so little, but I bought it because I really love the packaging! I think that I am a bit obsessed with Yunnan Teas. 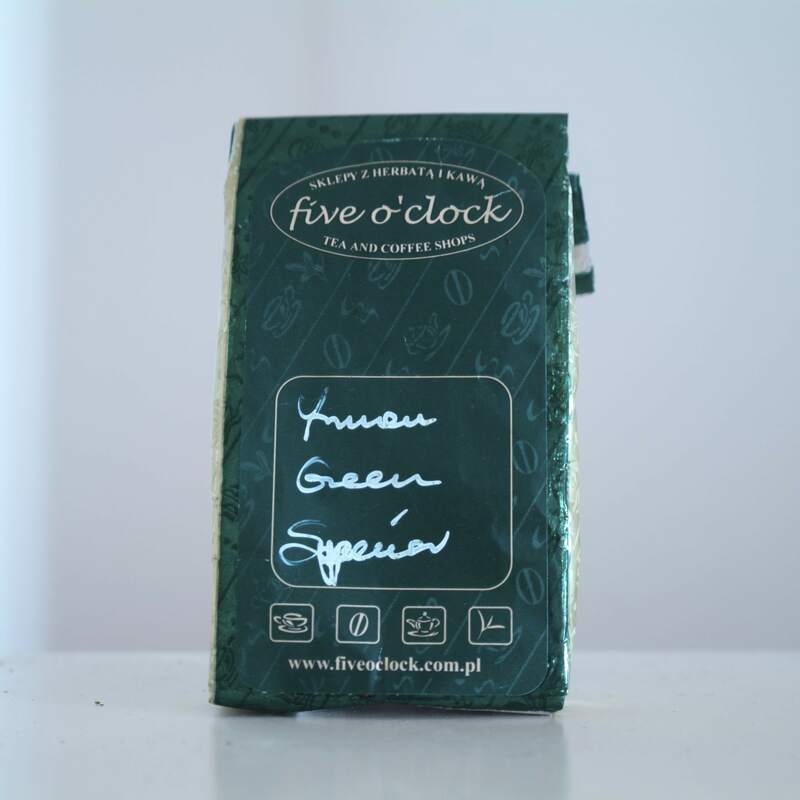 This one from 5 o’clock, a smallish shop in Warsaw is a good everyday Green tea, but is nothing out of the ordinary. I bought this Mate in Berlin for 1Euro. 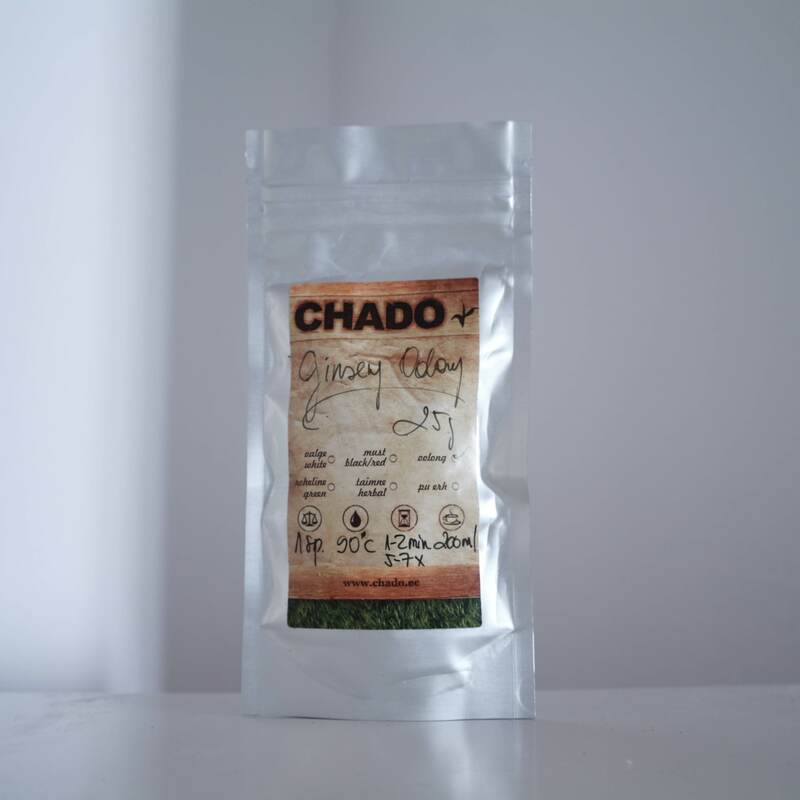 It is a roasted variety and is quite pleasant, being much smoother and less bitter on the palate than a normal Mate, but it lacks the magic punch and stimulation of the unroasted variety. This tea, which is not strictly ‘mine’, is delicate and sweet, with the smoothness of the Sencha balanced well with flower blossoms. A good quality and clear variety of Sencha tea from China. I’ve not tried this yet, and it is again not strictly mine, but I will let you know when / if I get my hands on it! 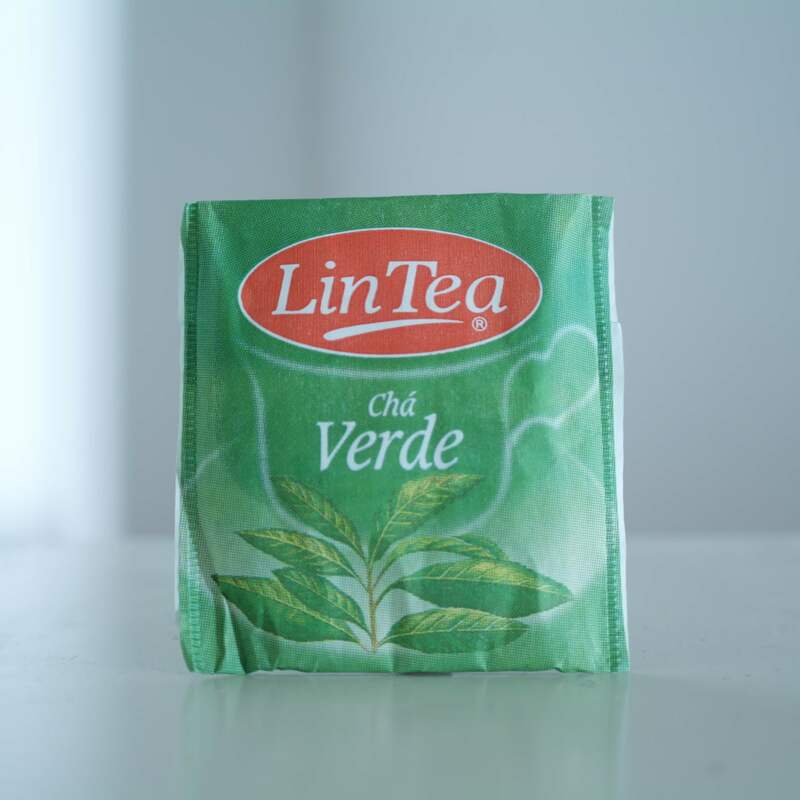 A standard Green Tea, but in a Cape Verde packet. 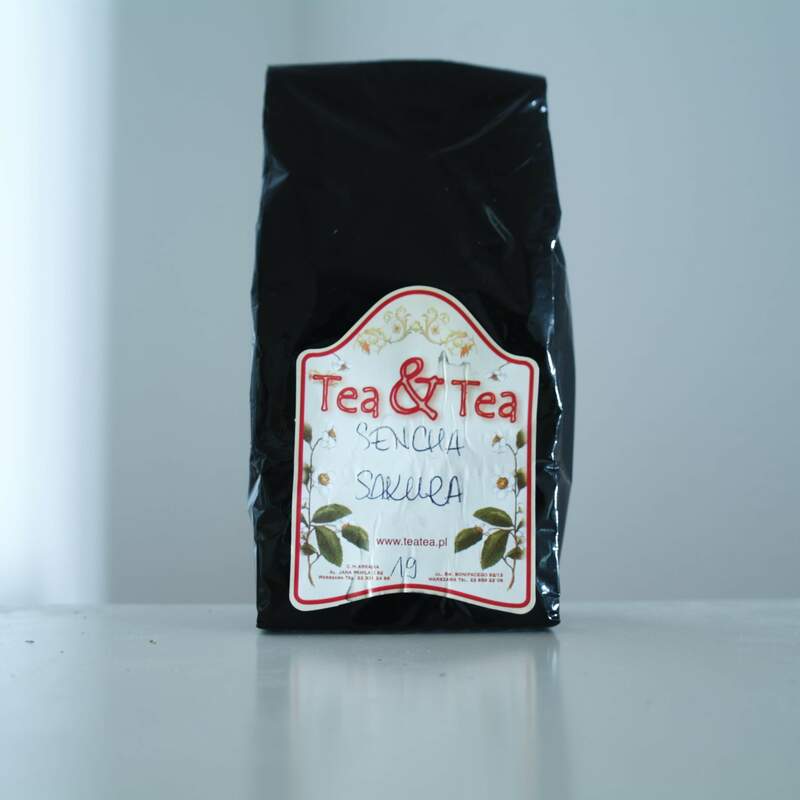 This is probably my most coveted tea, from Estonia I have been carrying this around since February. 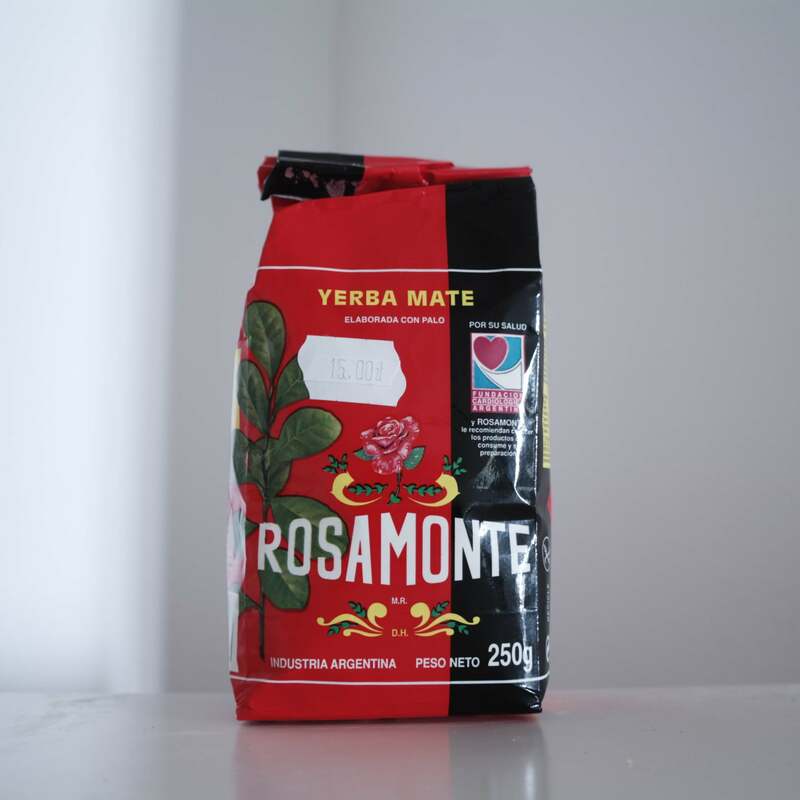 It is excellent, you can steep the leaves several times and it is delicate yet nourishing. If you happen to leave it a little long the Ginseng, in which the Oolong has been rolled, will start to create an odd, but not unpleasant, sweetness. 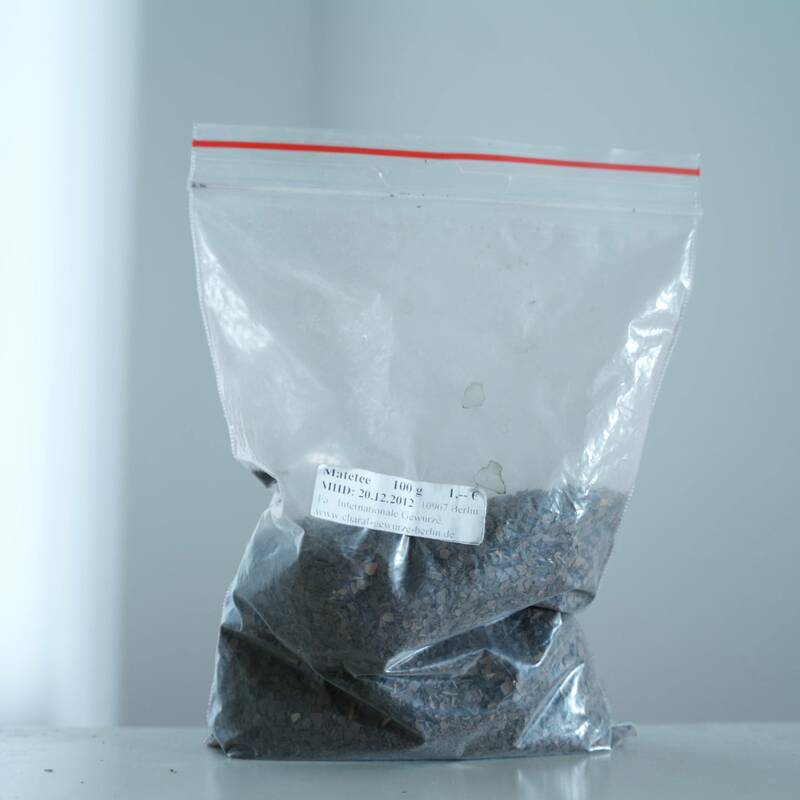 I love Mate, ever since I found it tucked away in a little farm shop in the middle of nowhere in England when i was about 16. This one is good, actually quite delicate in flavour, but it definitely does the job! Last, but by no means least, is my Yunnan Green Oolong. I brought this with me when I started my trip and it has been perfect every time. I am running extremely low on it now so will only drink it occasionally. It is perfect for lifting the spirits and refreshing the soul. 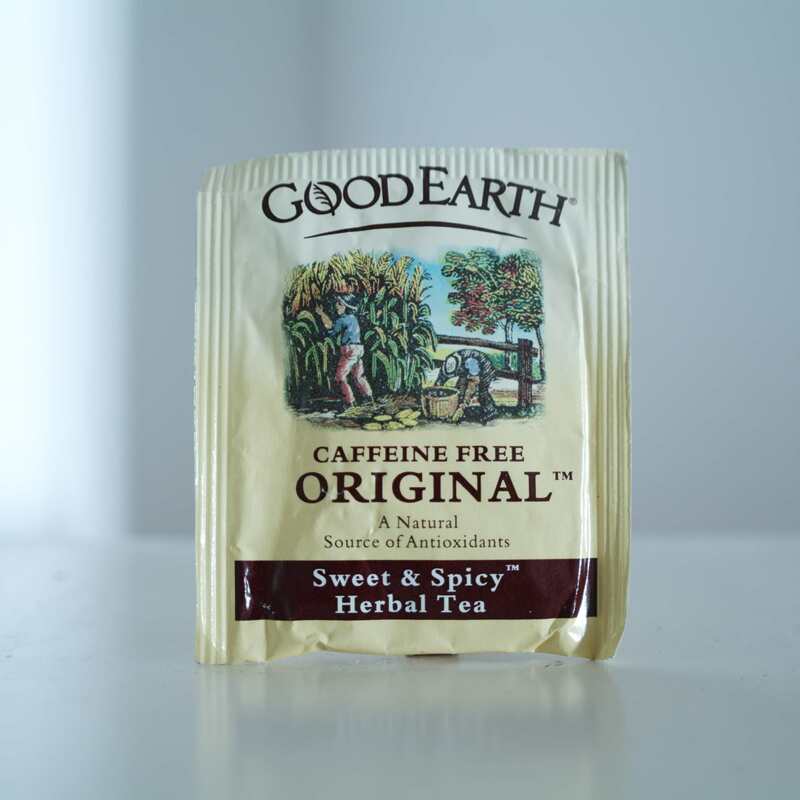 This tea is a life saver! So, a belated post! Went out last night and didn’t get chance to write this until this morning. Yesterday was yet another freezing cold day, and I think today is going to be even worse! 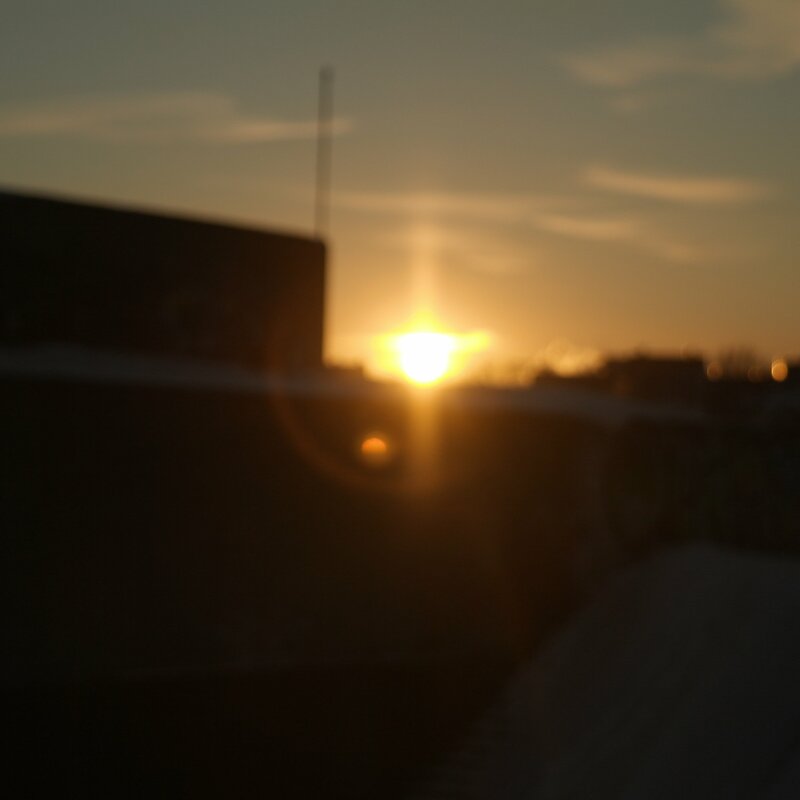 But the sun still shines and that makes me happy, and I will be heading for Tartu later, hopefully on a warm bus! I headed out around mid day again, this time I wanted to go back to the sea so I went down by the big old concrete Soviet Concert Hall ‘Linnahall‘ and looked out into the mist. The sea is covered by this low lying but dense mist, this is apparently caused when the sea temperature is warmer than the air temperature, and you get this spooky, slow moving mist about 5 feet tall and dense as a cloud. After I totally froze out next to the sea, my hands aching, even my toes through my big boots suffering a bit, AND my scarf freezing to my face!, I more or less ran back into the old town in search of a cup of tea and some warm sanctuary. I went to this cafe called Majasmokk, a fairly old school, traditonal looking cafe selling various cakes and pastries and lots of Kalev chocolate goods (which I actually managed to resist). I had a mushroom and pepper flakey pastry thing, and a cup of China White Monkey tea. 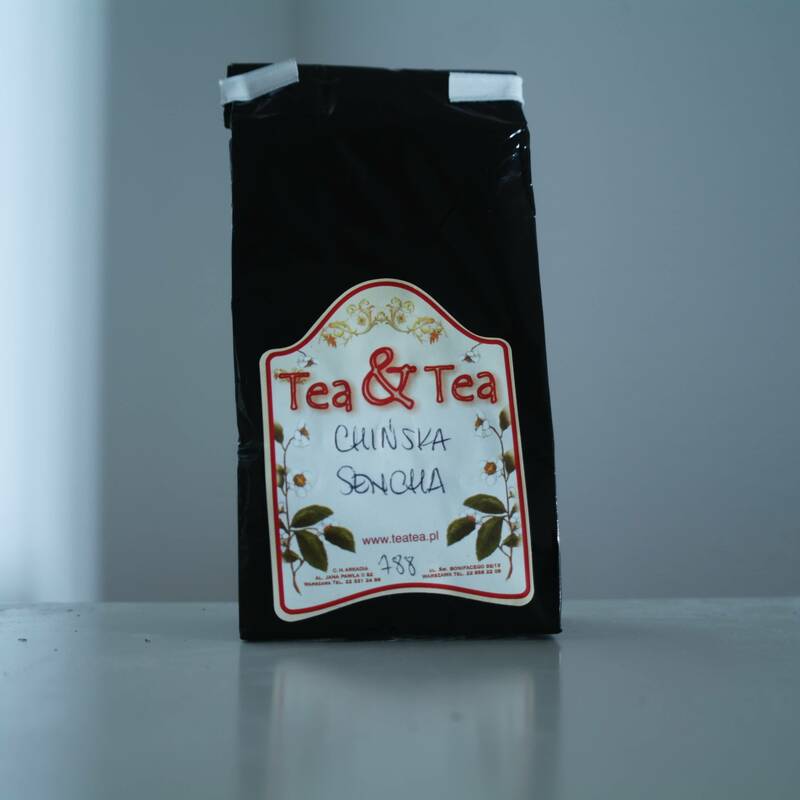 This tea is very interesting, quite a strong, nutty flavour comes out from the delicate green leaves. They don’t seem to colour the water much, and so I was expecting a tea more like your standard White tea, but, as I said, it is surprisingly stronger and not like most white teas at all. 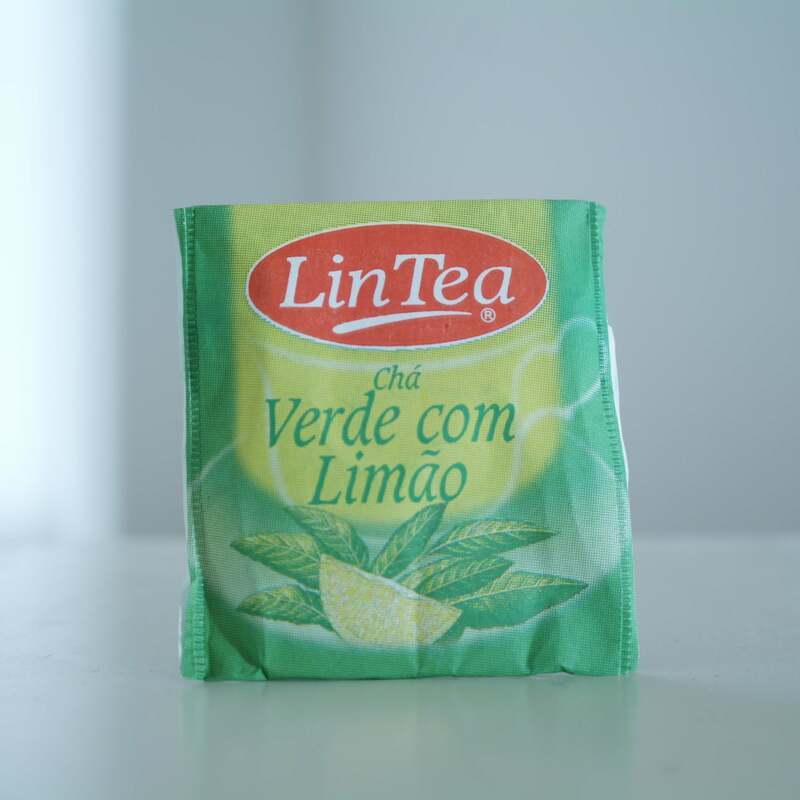 I thought for a while I was drinking a different tea, or that the filter had another flavour stuck in it, but after a bit of research it seems that is how it should be. After warming up, and then psyching myself up, I ventured back outside. After walking a little way the mobile phone Ingrid had lent me rang and she was on the other end, she had finished work early and was coming to meet up with me in town. I escaped the cold and went into a shopping mall while I waited. Looking through books and windows and pretending to be shopping. I met Ingrid and we went straight to another cafe, this time the chocolate cafe, Pierre Chocolaterie, tucked away down a little side road in the old town. We both had the same, a rum and raisin hot chocolate! It was very good, warming and tasty, with raisins in the bottom and a decent hit of rum. The cafe itself is nice and cozy, full of cushions and wooden furniture, soft lighting and dark walls. A lovely little place, but for treats only as it is a little expensive. We then headed back for home, though via the supermarket to buy some food. Another couch surfer and one of Ingrid’s friends were coming for dinner before we all went out to a couch surfing meet. I cooked, the request from Ingrid was a Shepherd’s Pie, but it would seem that it is basically impossible to find any kind of lamb in Estonia, it had to be Cottage Pie. I was quite pleased with the outcome, a nice tasty filling and I did my favourite thing, to put leeks in the mash potato topping, makes a big, yummy, difference! Food eaten, and all of it was, we all hopped in a taxi and went to the Red Emperor, a bar somewhere in Tallinn, it was dark and I was in a car so exactly where it is I could not say. We hung out there for a while, playing giant jenga, and watching people play pool, also laughing at the guy who was asleep on the sofa when we arrived (at about 10) and still there when we left at around midnight! Poor guy! We then went to a club, somewhere nearby the Linnahall again, danced for a few hours, to music that I’m more used to hearing in adverts and in my imaginations of bad mid-nineties clubs, than in today’s clubs. There were a little too many people for what was a very small space, but the little group of us that had gone managed to keep our dancing circle going and the music began to improve eventually. We left at around 3:30 and got in another taxi home. Today I am traveling to Tartu, hopefully some point soon, though I have to pack, but will try to fill you in later! Tea 24: Qi Pao Tea, from CHADO tea shop, old town Tallinn. Today had another gloriously sunshiny morning. 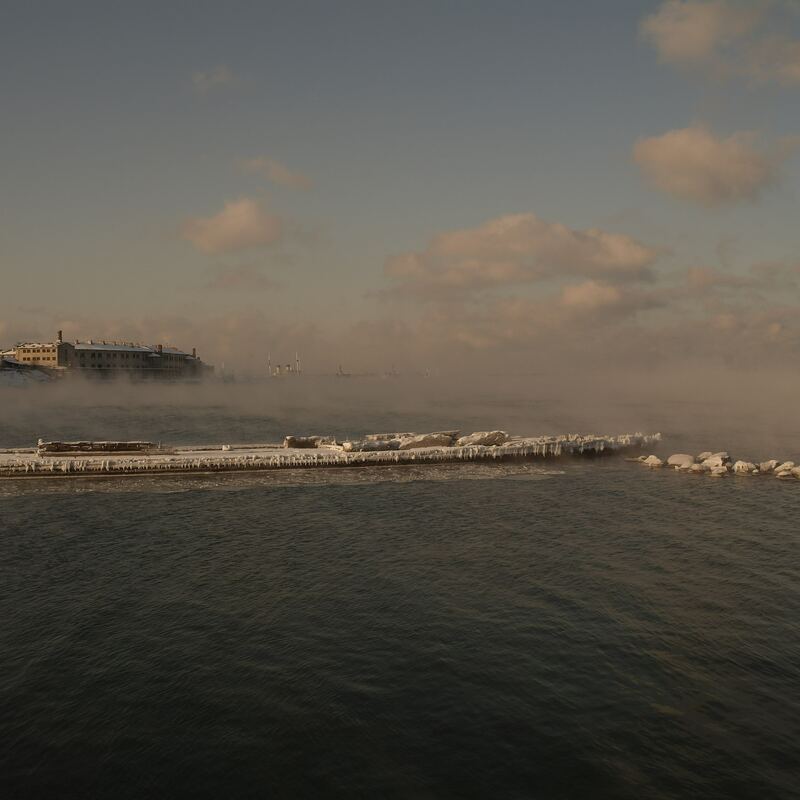 But yet again, the coldest day so far, I think -20 was the high today…. I left the apartment around mid-day and made for the old town again. On my way I wandered around some of the side streets, slightly off of the beaten track and was treated to various sights of old tumble-down, but beautiful wooden and brick buildings, literally next door to huge, modern glass structures, such as the Radisson Blu hotel, and the Sokos. The business hotels basically. 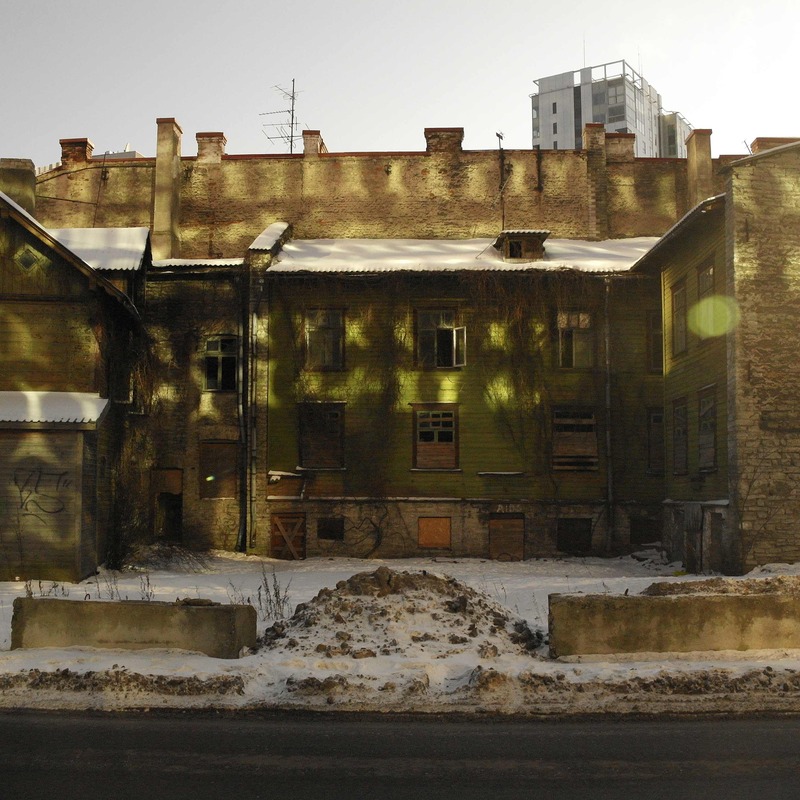 The sunlight was beautiful in these patches though, glinting off of windows and through the broken windows of the older buildings. I carried on towards the old town, and stopped off in the little Tammsaare park again. 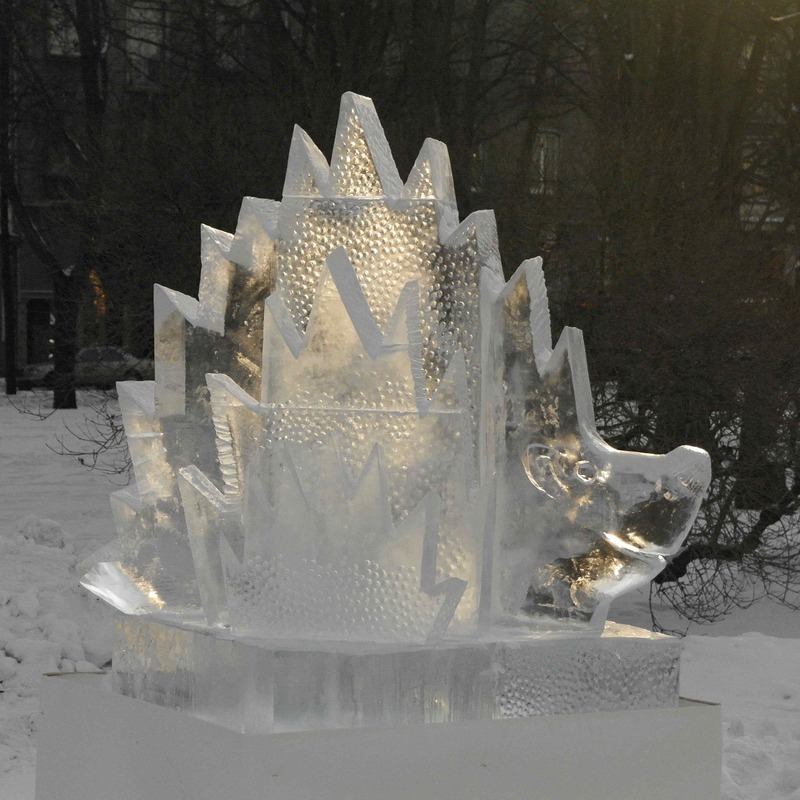 Today I noticed there were now quite a few ice sculptures that I am fairly sure were not there yesterday, a hedgehog, a wolf, an eagle, a knife and fork…. All sorts of things, glinting away in the low lying sunshine. 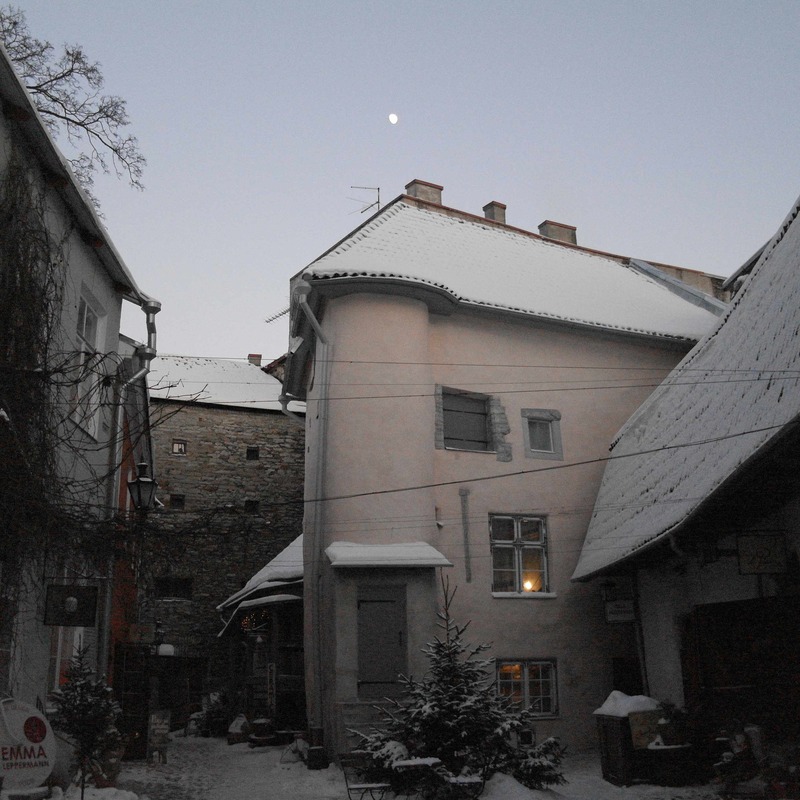 A few photographs later, and I was in the old town. I headed straight for the tea shop I had spied yesterday. What an amazing little tea shop, loads of excellent quality teas from all over the place. I stood and chatted to the shop keeper and her sister for ages about tea and traveling and all things inbetween. They were lovely people, very friendly, warm and inviting, and passionate about tea! It is really an amazing place, called Chado it is situated on Vana-Viru, a right turn directly after the main entrance bit of the old town. 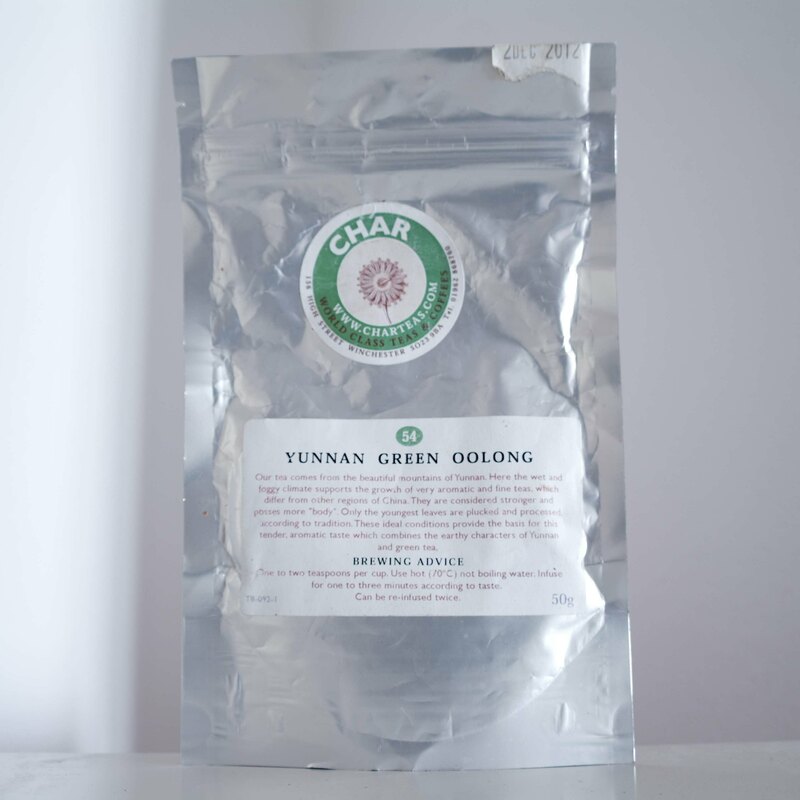 I chatted for a while and bought a cup of Qi Pao tea to go, as well as a small packet of Ginseng Oolong and a small sample of a mystery Pu Er tea they had gotten hold of, it is twelve years old, and hopefully will be amazing! I’ve not tasted either of these two yet, but as soon as I do you will be the first to know! I think I need to save the mystery tea for a proper occasion, with all the gear to get a proper idea of it. If you are in this part of town, and let’s face it, who doesn’t go to old town Tallinn, make sure to give this shop a look! There’s also a link to their website at the bottom of this page. So today I totally forgot to get the name of the place where I got my tea! I blame it on the biting cold adn the aching fingers. The cold is also to blame for the steamed up image, the lens on my camera totally steamed up and I didn’t want to wait for it to clear up before taking the photo….. So, yes, today I headed first for the Old Town. Wrapped up as warm as possible I left the apartment and soon discovered that as warm as possible was most definitely NOT warm enough! I think today’s high temperature was -10, but I am fairly certain this was optimistic. It was the coldest day so far I think, I had icicles all over my face! And leather / suede, thick lined gloves are totally ineffective it would seem! 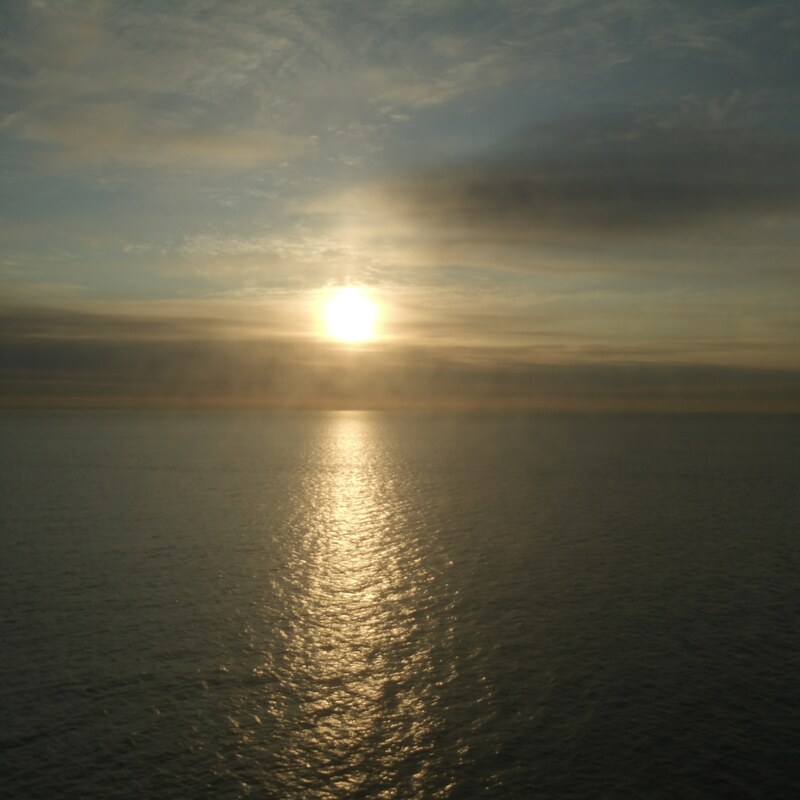 On positive factor was the sunshine though, and the, albeit psychological, warmth it brought was very welcome. There also seemed to be tiny bits of snow, which has now turned into proper snow, floating about in the sky glinting in the sunlight like glitter, despite a seemingly cloudless sky. It took me around 10-15 minutes to walk into the old town, through the pretty little Tammsaare Park and you are there. The ancient medieval gate towers at this entrance are very impressive. Then it’s up hill towards one of the three main churches that stand atop of the the hill. Winding cobbled streets weave a rabbit warren of multicoloured houses, cafes, restaurants and millions of souvenir shops. Make it to the top of the hill and you will probably arrive at the orthodox Alexander Nevsky Cathedral, a Russian built impressive and imposing looking building. I wandered inside to be quite shocked at just how small the place is. The inside space is tiny, magnificently decorated, but how they ever hold services in there I do not know. There were about four people in the place and it felt full! I only stayed in there a short while before heading back outside. I turned right out of the entrance and up a small street (ok, they’re all small) past what seemed to be a ballet school and a drama and music school then past another church and onto a viewing platform that looked out over the west of the city. Views of modern buildings mixed with modernist buildings mixed with the old, whilst factories billowed out smoke from chimneys into the clear blue sky. I was now starting to get really cold, so I went in search of food. There are quite a few nice looking restaurants around the old town, and you can eat from many different country’s cuisines. After spending much too much time procrastinating, again the cold not helping brain function, I went into a deli whose shelves were filled with lovely looking things. I went for a Goats Cheese and Spinach lattice type thing and a cup of the above-mentioned tea. I sat down, took my gloves of and tried to move my fingers. They were so cold I could hardly hold my tea it felt so hot. Eventually they warmed up and I drank it up, it was nice a mellow, not too acidic with the fruit and the right flavours to warm the cockles! By the time I had finished my Spinach thing and was thinking about leaving the girl from behind the counter came out and started putting discount stickers on some of the cakes… So clearly I took that as a sign I should stay and have one. I treated myself to a Sacher (or Sachertorte as research has now found out), a traditional Austrian cake which basically consists of chocolate cake, apricot jam and then a layer of chocolate to cover it all up. It was delicious!!! The perfect thing to get me back into the frame of mind to face the outside. I was now heading back east to KUMU, the art museum, to hang around there until 6, when a documentary about Olaffur Eliasson’s New York City Waterfalls project was being screened. The gallery is an amazing building. Shaped and lit really well. 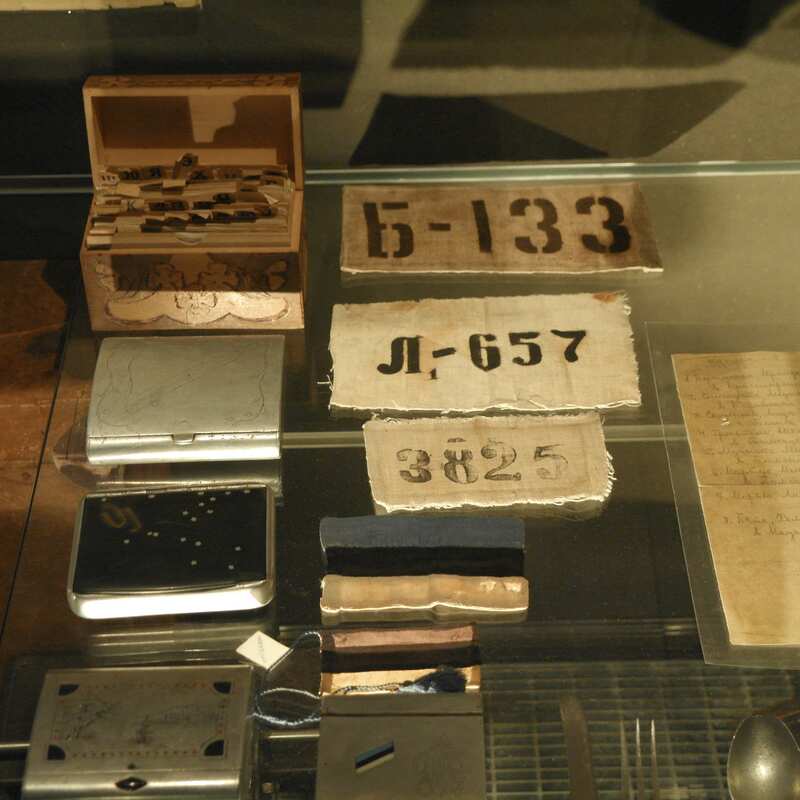 It basically goes chronologically through time showcasing numerous works by Estonian artists. Many of the pieces are really great and for the first time in a long time I am once again enjoying looking at classical painting. 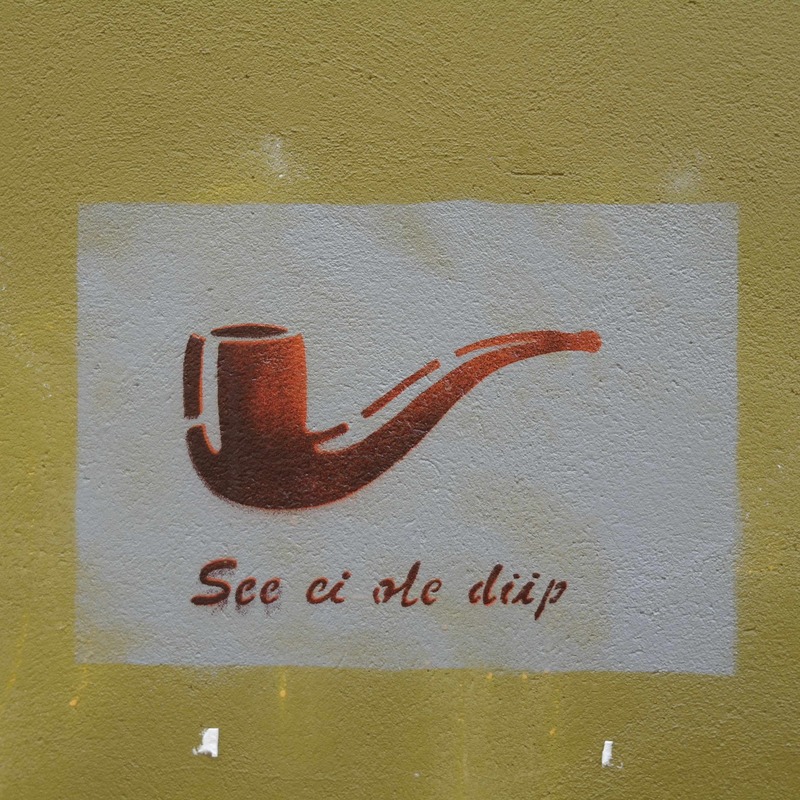 I think it may be down to the fact that most of these artists, if not all, are completely unknown to me, and also just their subject matter, and their motivations are different from the more western European styles, although they do clearly have the same influences and come from similar schools. I can’t really put my finger on it, but it is nice to be able to enjoy looking at these things again. The top floor is currently showcasing works by various contemporary Danish artists, some of which is really very good, other’s not so good. A noteworthy has to be Jacob Kirkegaard, whose video and sound installation is excellently executed, completely enthralling. I also enjoyed the work of Rolf Notowny and Marie Kølbæk Iversen. After a few hours spent wandering around in there, and only just realising I had missed a large space, though I wasn’t too keen on the work, so it wasn’t so bad, it was time for the film. The auditorium was packed, but i guess that’s what happens when you show a film by an artist like Eliasson. The film entitled ‘Olafur Eliasson: Space is Process’ was good, charting the ups and downs of his planning, developing and eventual execution of his project to change the new york city environment and to create ‘one more story for the city’. It was intriguing to see into the world, and to some extent, the life of such a well respected and prolific artist. Ingrid and I then visited Kom Pot, a lovely little restaurant serving traditional but modern fayre, in a lovely space, filled with jars of their own compote (I’m assured a traditional Estonian foodstuff and pastime), light fittings made from graters and colanders, clocks from spoons and forks, and a feature sofa area dolled up like a Soviet 50’s household. The food was really good, I had a traditional Estonian meatball dish with Beetroot salad and sea-buckwheat sauce, whilst Ingrid had another dish consisting mostly of pork crackling and mash-potato, but it was very tasty despite how it sounds. For dessert I had a great compote dish with Kama Mousse. Kama is basically the Estonian equivalent to porridge I think, but as a mousse it was very tasty and the mixture of fruits in the compote was delightful! Tea 22: Südame Tea, Park Cafe, Tallinn. What a wonderfully sunny day. After cooking a semi-traditional English Breakfast for my host this morning, semi-traditional due to the lack of British style sausages, though we did manage to find something very similar to Black Pudding here in Tallinn. I’m not sure my host realised quite how much meat was involved, but it certainly filled us up and gave us energy for most of the day. We headed out into the beautiful sunshine towards the East, to an area of beautiful park land and then onto the sea, whose frozen edge we walked along, photographing the ducks and swans whose feathers were glinting in the bright, low-level sunlight. 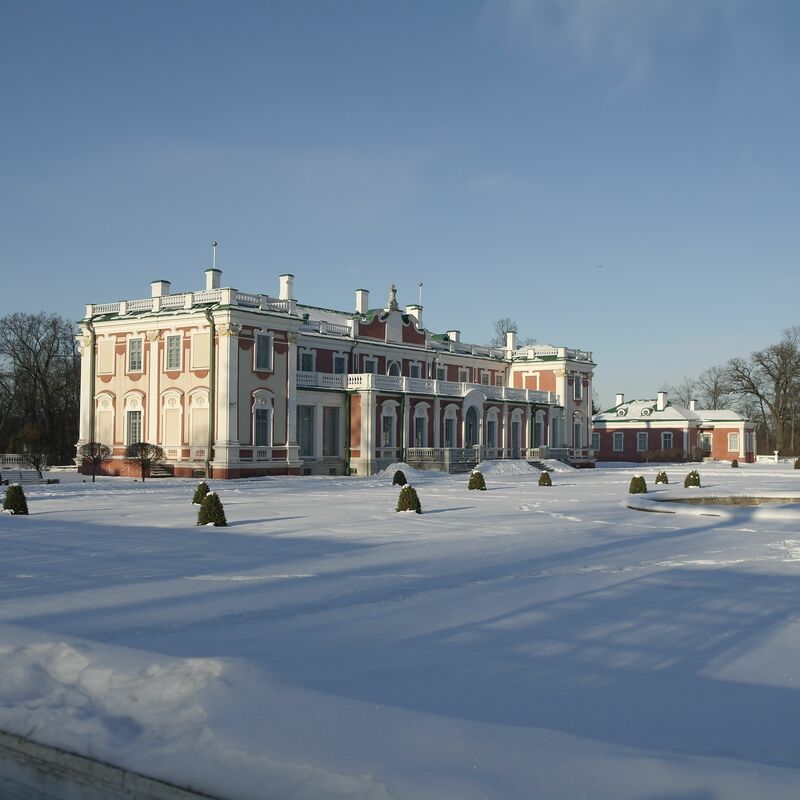 We then headed to Lauluväljak, the Tallinn Song Festival Grounds. 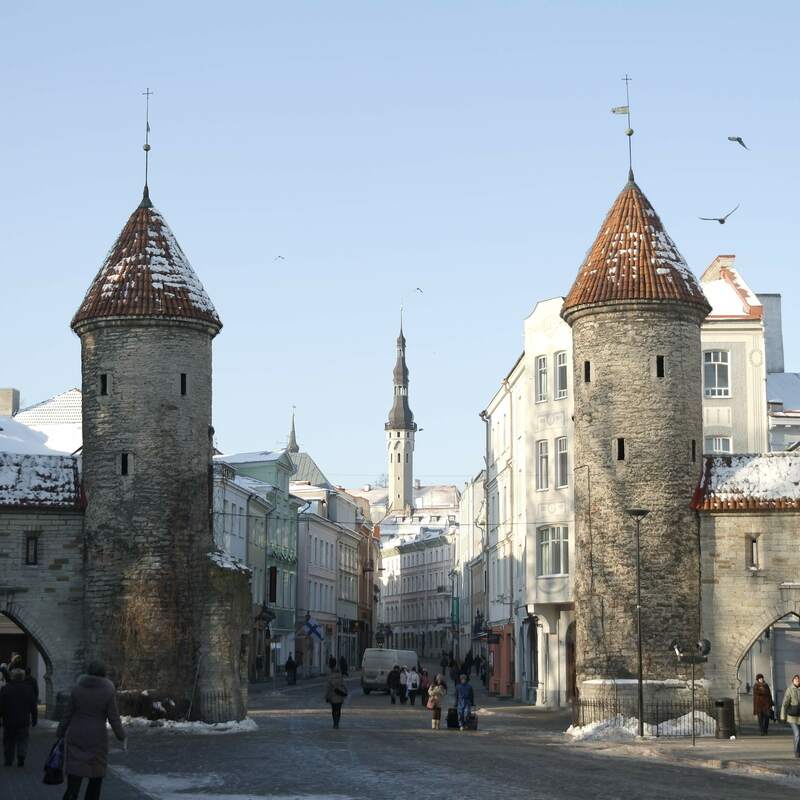 This is huge area, that, during the traditional song festivals, can hold about 100,000 people, 30,000 of which will often make up the choirs who sing traditional Estonian songs that can be heard for miles around. 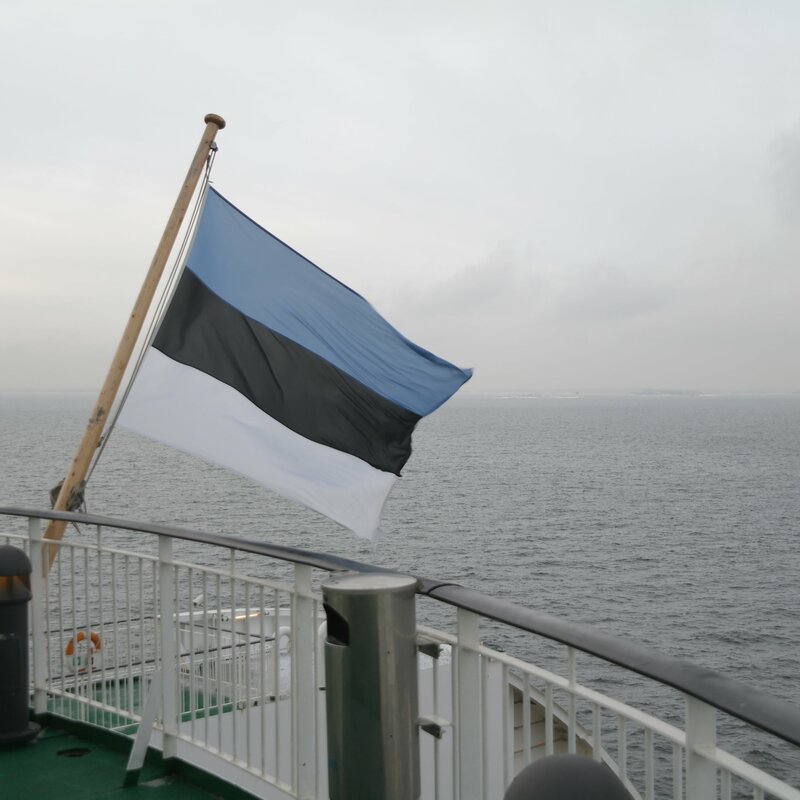 This is also the spiritual heart of Estonia’s Singing Revolution, the event that represented the end of Russian Occupation and the dawn of Estonian independence. We wandered to the top of the hill and then, rather sporadically sat on a bin bag, and slid down the rather bumpy but snow covered hill back to the bottom. It was good fun, though pretty cold and we both got rather wet bums! We then intended to visit KUMU, the Tallinn contemporary art museum, an impressive building of glass and metal, that has oxidized to turn green. Unfortunately it turned out the gallery is closed on tuesdays during winter, so we climbed another hill, explored an old signaling / navigation post, then headed back down through the park. At the other end of the park is the Park Cafe, a lovely little place, rather posh in appearance and it sells a good selection of teas, one of which features above, a traditional Estonian tea, a mixture of herbs including Parsley, Camomile, Nettle, Lemon Balm, Chickweed, an Birch Leaves! It was very nice, tried it with and without sugar and it was very pleasant, delicate flavour, kind of savoury without the sugar. Also had a lovely cake with raisins and pumpkin seeds. After a lovely time chatting and drinking our tea, and warming out hands and drying our bums we headed back out into the cold. We could only manage a short distance before our hands started to ache again. So we headed into a lovely Eco/Organic shop, where I bought, yep, you guessed it some tea! We headed back out and wandered back into the city centre and wandered around for a while, making it to this nice bit of town called Rotermann, where the old literally meets the new, physically in most cases, bits added onto old buildings, old buildings renovated. We looked around a bit then went into the Kalev chocolate shop, hundreds of beautiful sweet trats greeted my eyes. After a while trying to decide I went for some Dark Chocolate with Raspberry, some Dark Chocolate Orange and Green Tea, and Dark Chocolate with Cherries. Ok, so less of a decision over which ones to buy and more of a decision to just buy them all…..
After that we headed back to the coast to a place called Linnahall, a tremendous sprawling concrete concert hall. 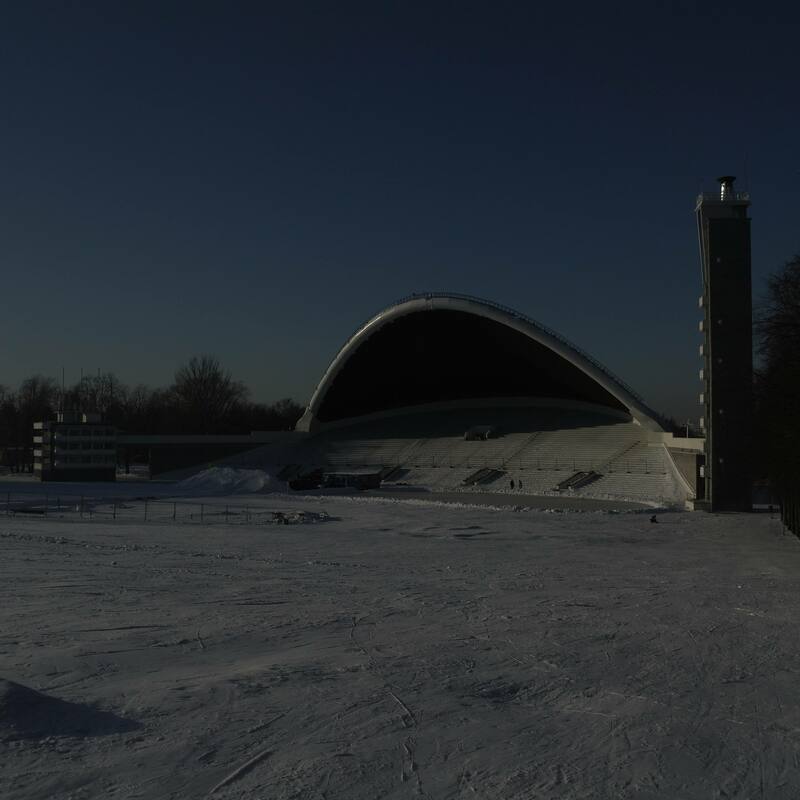 It is a constant reminder of the soviet era, built as a concert hall but also a defensive position for the Soviet Army in the event of an attack from the the Finns. The space is now closed but you can still walk up onto the buildings roof area and over the back where there is an operating Helicopter Pad, which apparently runs helicopter trips to Helsinki. We could also view the old fortress prison from up here, and some beautiful views of the city, with the glorious golden sun setting over the old town’s spired churches and buildings. A really beautiful sunset for the second night, the air is so clear and there are pinks, purples, golds, yellows, oranges, the whole rainbow is represented somewhere during these glorious times of the day. We then walked to the Kalamaja area of town to get something to eat, walking through the train station, great big old concrete warehouses and factories until we reached Telliskivi, the arty, bohemiam area of the city. Factories have turned to bars and artists studios. We ate in an amazing restaurant bar called F-Hoone. Really great food was had, we shared a brushetta platter, Mozzarella and Tomato obviously featured, but alongside gorgonzola and pear, Garlicky Houmous, and a great mixture containing pumpkin seeds. Then I ate a really lovely Linguine with Garlic, Chilli and Prawns, Ingrid, my host, has a great smelling and tasting Thai inspired Coconut soup with Salmon. Really good, and all washed down with a great Estonian dry Cider (Kiss in Estonian). A lovely meal, and really, really reasonably priced. We then jumped on a tram home and are now drinking port and watching junk on the TV! Brilliant! Tea 21: Feel Good Tea, Ingrid’s Apartment, Tallinn. So i’ve made it to Tallinn! 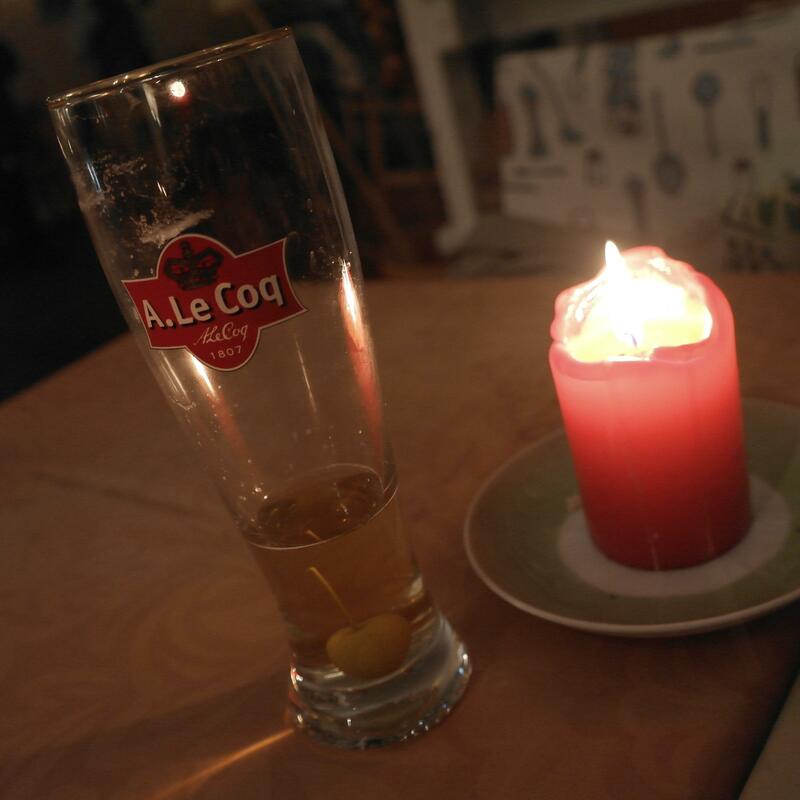 Safe and sound, though rather chilly, the weather is forecasting a lovely -22’C tonight……. The boat trip was pretty easy, just turned up, got on, waited and got off again, then it was a short bus ride to the city centre and I managed to navigate myself to Ingrid’s flat. I was greeted with some lovely Feel Good tea, which has basil, tarragon, apple and all sorts in it. Very nice indeed, and make in a lovely glass teapot, which makes a big difference. 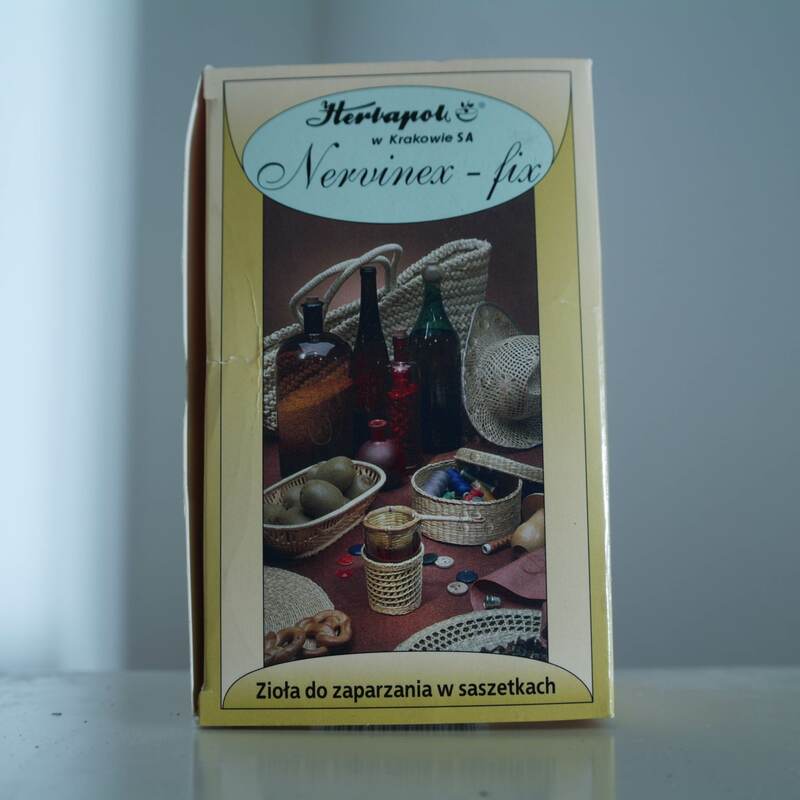 Also got treated to three Estonian classics, firstly Elk butter (aka pâté), on homemade bread, then a bit later on, after a quick shopping trip, another traditional dish of pork jelly (imagine the jelly bit from a pork pie, so, mostly that with bits of pork in it) though made from wild boar. It was a little bit unattractive at first, but it actually tastes pretty nice. It is served with strong mustard and vinegar. On bread too. Then the Pièce-de-résistance, dark chocolate with espresso filling, from Estonia‘s oldest chocolatier. Lovely! The company is called Kalev. On the boat over I actually managed to sample their chocolate. Well, I say sample, I mean buy a whole bar and eat it. It was dark chocolate with Grapefruit and was really good. I look forward to trying their other delights! Stuff here is already noticeably cheaper than in Finland, transport and food, so hopefully I can make amends on the expensive-ness of the Scandinavian leg. Tomorrow Ingrid has kindly taken the day off work to show me around a bit, I think we will go to see a gallery and a park and probably go for some tea or hot chocolate somewhere, I’ve already heard of some decent places! Fingers crossed! Sorry for short postings today, quite tired and it’s time for bed!